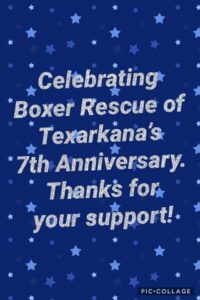 Boxer Rescue of Texarkana » Saving One Boxer At A Time! Saving One Boxer At A Time! Thanks to all of our foster homes, adopters, donators, supporters, volunteers, Vets, and their staff!! PAYPAL button is now on the Tshirts For Sale link on the left. There are two styles and 9 colors to choose from in CHILD and ADULT sizes. You can buy the t-shirts at our events for $15. Can you please help by fostering? We do not have a facility. We are foster home based so need your help. We can only rescue Boxers with help from foster homes. We pay for the vet bills, crates, and can provide the dog food. You get the best part, making them part of your family and getting them ready for adoption. They do need to be indoor dogs and have a safe fenced in yard to run and play in. All of our Boxers live in Foster Homes until they are adopted. 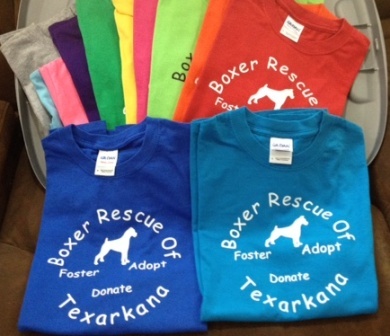 The more foster homes, the more Boxers you can help us rescue!